The Sea Slide Galaxy is a galaxy in Super Mario Galaxy. This galaxy, similar to the Loopdeeloop Galaxy, has a band of water flowing through it. However, unlike the Loopdeeloop Galaxy, this galaxy's stretch of water is circular and without a current. This galaxy also has many islands and landmarks, such as a large tree and a lighthouse. The Sea Slide Planet is the main planet. It consists of a starting island, a lighthouse, a cannon island, a cave area, a water-driven machine, and a mangrove tree. All of this is connected by a large stream of water. The main inhabitants are penguins. They hold races there every once in a while. When Mario first gets there, Guppy is invading the planet, and wreaking havoc. In the first mission, a Sling Star will take the player to a Starshroom where a bird's eye view of the planet can be seen. As seen from the Starshroom is the Sea Slide Planet (ring) and the Ocean Puddling Planet (the ring surrounding it). The Ocean Pudding Planet is a small planet inhabited by crabs and Penguru. It floats in the middle of Sea Slide. This planet is accessed only in the Silver Star mission. 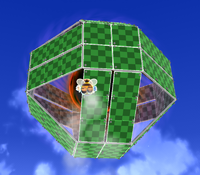 Bee Mario flies towards the Van-Van Vanish Lv2 Zone. Van-Van Vanish Lv2 Zone is a big planet that is made out of Shrinking Tiles. It has a black hole in the center. Mario must collect all the music notes on it to turn the black hole into a Power Star. This planet is identical to the Hurry-Scurry Planet in the Hurry-Scurry Galaxy, except that this one has music notes covering every square, showing, if done, the planet as how it seems when totally cleared, hence its name being called "Lv 2". This red Starshroom that can be accessed by use of a cannon. Pull Stars nearby help the player reach a Silver Star and a 1-Up Mushroom. It can also be accessed via a sling star in the first mission, which is slightly before the point of landing. This mission's objective is to race Penguins. This mission's objective is to find the five Silver Stars. This mission's objective is to race Cosmic Mario/Luigi. This mission's objective is to collect the Purple Coins. This mission's objective is to feed a Hungry Luma and collect notes. The Sea Slide Galaxy appears in Mario Golf: World Tour, as well as Mario Sports Superstars, in the background of Rosalina's Eagle, Albatross, and Hole-in-One animations. The large ring of water that comprises most of the Sea Slide Galaxy is in fact contained by a light blue wall-like barrier, as opposed to the water in the Loopdeeloop Galaxy and the Loopdeeswoop Galaxy, which is not surrounded by anything at all. The barrier itself is so close in color to the water that it almost cannot be seen at first glance. The player is able to walk on this barrier. This page was last edited on February 26, 2019, at 18:44.